Next time you pass the point where the western end of Betty’s Bay’s Porter Drive meets Clarence Drive in the next two weeks or so, slow down, take your time and look in a north-easterly direction across the field at the southern end of Ed’s Valley. You’ll see the yellow spikes of Erica patersonii aka ‘Mealie Heath’ spread out across the landscape. Erica patersonii, Mealie Heath, in one of only four known locations, this one at Betty’s Bay. Not everyone gets to see them these days – they are listed as Threatened and occur in only four known locations, one of which is a vulnerable patch close to the Cape Point section of the Table Mountain National Park where only 15% of their location is formally conserved. The rest are in our area. 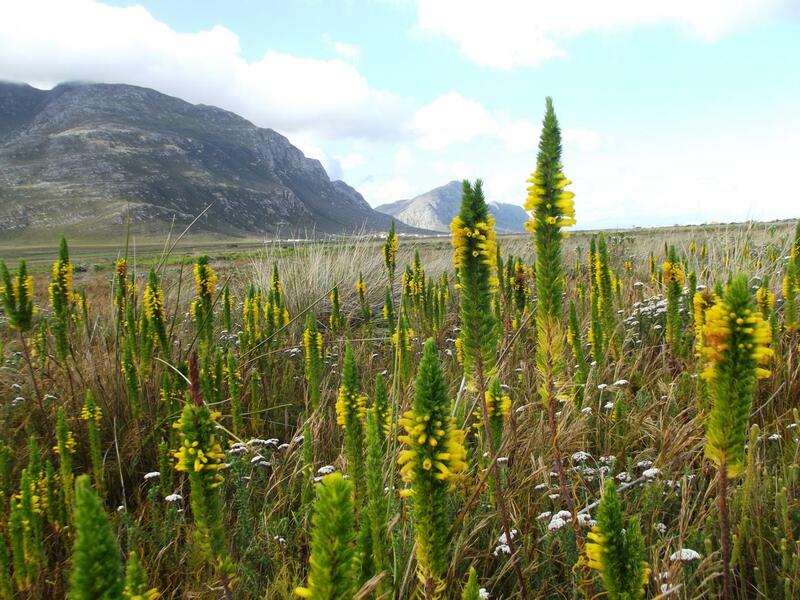 They are already extinct in the Hermanus area due to over picking, urban sprawl and invasive aliens, according to Anne Bean and Amida Johns in their Hottentots Holland to Hermanus Wild Flower Guide. Take your time to enjoy them – and pay a little tribute to our hackers who, over many years under Ed Silberbauer’s leadership, rescued that valley from an immense invasion of alien invasives. Those Erica patersonii are a testament to persistent, dedicated conservation by heroic Kogelbergers!